We have set out on this musical mission to bring live performances, of all kinds W/Wind and Brass, into our community. With so many great players around we wanted to use what facilities we can offer to help people get to see more live music and hopefully inspire them to LISTEN and PLAY more. We wanted to start with a bang! Knowing Nick Blake personally as an ex colleague and co-player we knew he shared our passion for reaching out to new audiences and spreading the good word of live music. 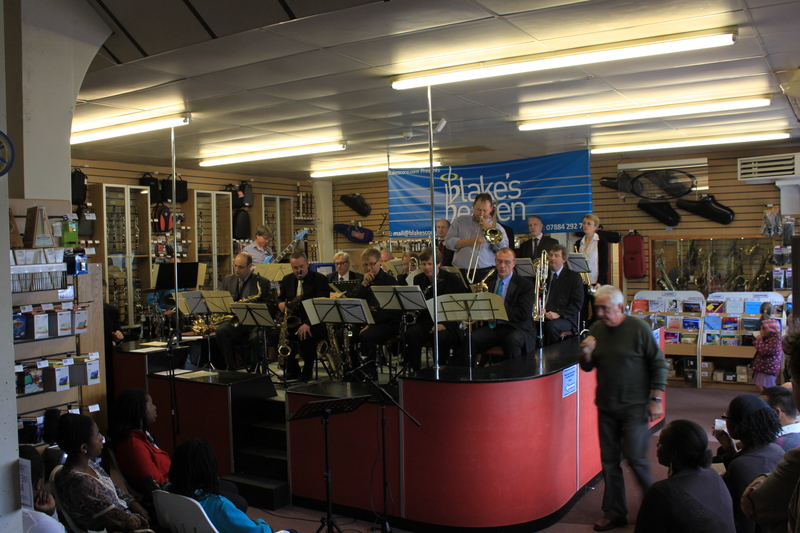 Running a Big Band like ‘Blakes Heaven’ is no easy task and it’s certainly not a profitable task! The hours of work that goes into arranging the music, organising band members for rehearsals and gigs is certainly a labour of love. But, knowing the band well (as an occasional dep), I knew they were the right group of players to kick us off. We then had a lining up of the stars so to speak, our good friend Tevis Laukat from Cannonball Musical Instruments informed us he was going to be in Europe for part of June, we already had the band in the back of our mind for a gig and it just seemed to make sense that Tevis and Cannonball should be involved. As a pioneering company with fantastic products the Cannonball brand and owners share our passion for live music and we knew with Tevis and the band on board we already had a good start. Speaking regularly as we do to the Cannonball artists we mentioned to them that the gig was a possible, thankfully 3 of our top guys were available on the day and so the date was set. 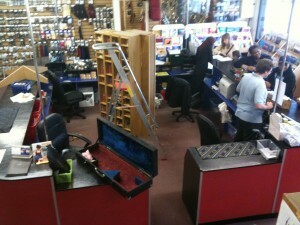 Great help was found with our regular stand/display design company SD Displays of Maidenhead. Like us they’re up for a challenge and everything is possible. With some thought, design and inspired guesswork (based mostly on hope and desire) we came up with the idea of hosting the band inside the current sales desk. Of course, the first concern was safety, the stage had to be totally secure to take the weight of 16 grown adults and equipment. 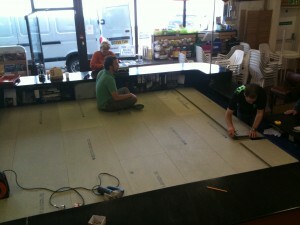 Much thought was given to this so that we could also use the stage into the future in different sizes and places. The plan was made, the components were ordered and constructed, the promoting of the gig began, and the most asked question from puzzled customers was: “how are you going to get a big band in here!!”. There were other considerations of course, where would the audience go, and how could we make sure everyone had an enjoyable time; customers and band members! Although we had concerns over the actual volume of the band in the shop space we tried to make adjustments to help keep this to a minimum. The drums and bass were placed furthest from the audience with sound deadening material under where they were sat. No amplification was used except for the singer and soloists, even then this was through a modest PA and balanced so as to not blow anyone away. Clearly, if you were sat right at the front it would be loud, but way under levels in a pub with amateur rock bands, and clubs on a Friday/Saturday night etc. We also provided space outside to give a haven for refreshments and a break from the music if wanted. On the day the band performed really well, the arrangements were weighted heavily to feature the guest soloists so of course it was a Sax heavy event. We had many comments from customers saying they liked the original style of the band, something Nick works very hard at. We were lucky and pleased to have Paul Jones (BBC Big Band) sitting in on lead Alto, complimented by Duncan Lamont (Multiple West End shows) on 2nd Alto, Simon Spillett (BBC Jazz Awards winner) and Tevis Laukat (Cannonball CEO) took Tenor duties as guest soloists. Each player has their own style and this was hopefully reflected in the music chosen for them to feature in. The day was topped off with a free prize draw, where the prizes included; a £50 Dawkes voucher, 2 x tickets to Ronnie Scotts Jazz Club and 1 x Lesson with a Cannonball Artist. We also decided it wouldn’t be a bad day to launch our biggest ever Sax Accessory Sale and some bargains were snapped up. We’d like to publically thank all the guest Artists, and of course the band for giving us their time and skills. We’d also like to thank all the customers who made the effort to get out on Sunday to see the gig and support local LIVE music.